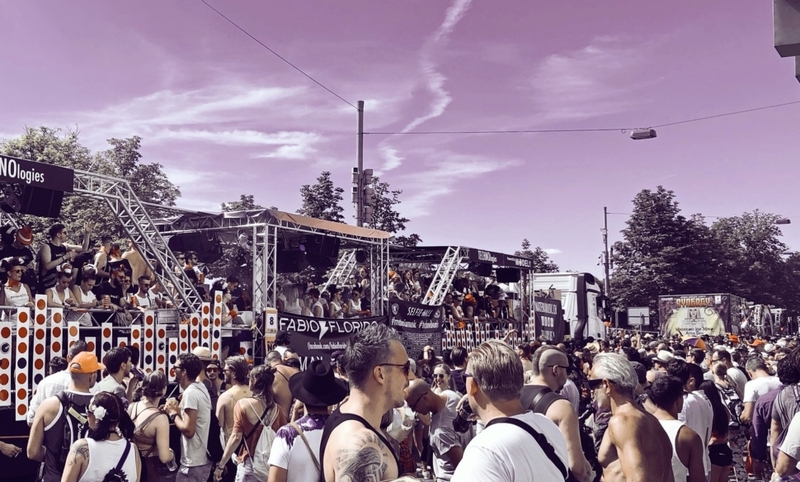 Zurich Street Parade is one of the biggest OPEN-AIR techno parties on the planet. The 27th Street Parade is taking place in Zurich on August 11, 2018. Every year in August, hundreds thousands of people from all over the world come to Zurich for an incredible techno party and unforgettable experience. Besides 30 decorated dancing trucks (Love Mobiles), there are 8 stages with top Djs, incredible music and laser shows. All day long you can enjoy parties around Lake Zurich. Famous DJs from different countries will play their best bits of electronic music for all music fans and dance enthusiasts. The first Street Parade was organised in 1992 by Marek Krynski as a “demonstration in support of love, peace, freedom, generosity and tolerance”. In the first year (1992) over 1000 ravers attend the Street Parade (it was a great success back at that time). This number has grown dramatically since then. In 2015 over one million people visited Street Parade. In 1994 the parade was almost banned for being too loud, too dirty and too big, but unbelievable support from the media, people and politicians made it possible to organise it anyway. At that year over 30 000 people were on the Parade. In 2017, for the first time ever, the Street Parade was transmitted live worldwide for eleven hours. Party starts at 1pm and will be going till midnight. This year, 30 music trucks, 8 stages and over 200 DJs will create fantastic party atmosphere. The Street Parade will start at Utoquai, Seefeld, from where it will be driving around the lake via Bellevue, Quaibrücke and Bürkliplatz, arriving at Hafendamm Enge at around 10 pm. The top Djs like Nic Fanciulli, Paul Kalkbrenner, Nicole Moudaber, Joris Voorn, Andrea Oliva, Luciano and others will share their music and energy with the crowd. The after-parties will be all around the lake until midnight. Use sun-protection, ear plugs and wear very comfortable shoes to avoid health problems and injuries. Drink a lot of water. You can get beverages from official refreshment stands and mobile vendors. Swiss francs only. Exchange offices can be found at the venue. Check the map below. The complete list of Djs, stages and program, you may find on the Street Parade official website. Let’s have fun with a healthy sense of responsibility! We should remember, that the purpose of the festival is a demonstration of love, peace, tolerance and freedom. Lets be respectful to each other. Also, take care of yourself. That means, NO alcohol, NO drugs, don’t litter, don’t climb over buildings or traffic lights, don’t jump into the lake, don’t touch the wires. Following these simple guidelines, you will get a unique experience and awesome atmosphere of the great open-air techno party. Enjoy electronic music, have fun, dance and celebrate the culture of tolerance during 27th Street Parade!